This is a question/email that I receive very often. The dilemma of being a swimmer who utterly crushes it in practice but struggles to swim well in competition. The issue is infuriating as it is confusing. After all, when you hop into the pool at practice your stroke feels good. The water flows effortlessly beneath you. You explode in and out of the walls. You are in total performance of your performance from beginning to end. At the end of the training cycle your confidence is running high. You’ve done the work. You’ve thrown down hard on the main sets, you took care of that injured shoulder, you ate like a champ, even took extra time after practice to do extra core and mobility work. By the time you get behind the block, however, that confidence has crumbled. Gone is the confident, calm, poised swimmer you were in practice. As you wrestle yourself into an over-priced tech suit you tremble with worry, a shade of the swimmer that you were in training. 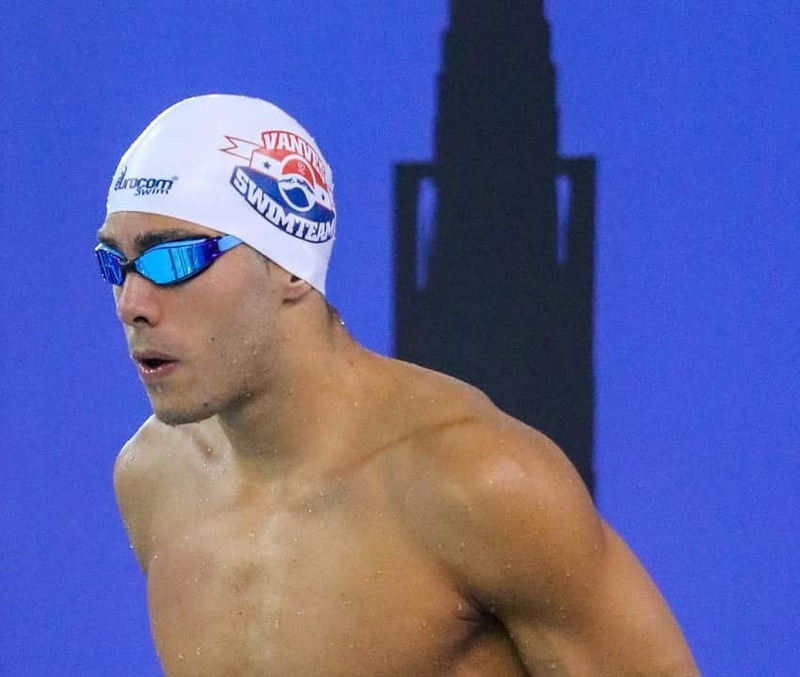 Where in practice your stroke was effortless, smooth, and powerful, in competition it’s awkward, feels harder, and you overthink everything from how you feel in warm-up to how fast the competition looked during their respective heats. It’s the helplessness of not being able to call upon your hard work, talent and natural abilities in the pursuit of maximizing your potential. The frustration of not being able to see what all the hard work can do with some rest, a successful taper, a shave and a racing suit. Over time you begin to accept that this is the kind of swimmer you are. Let’s take a step back for a moment and compare practice and competition. The pool is the same length. The events are the same distance. Goggles, cap, suit—pretty much the same. There are lane ropes, backstroke flags, the nearly overwhelming scent of chlorine, and other swimmers in the pool going toe-to-toe with you. The only difference is your mindset. The thing that separates training from competition is the mental approach that you are taking with you behind the block. You are getting caught up worrying what other people think. There are (a lot) more people in the stands in competition compared to another regular old day at the practice facility. Your teammates are watching from the stands. Your parents are up there, too. Your coach, with the psych sheets rolled up tightly in his fist, watches on. Getting up and swimming in front of everyone can make us feel nervous. We being to worry about what others think. The fear of negative evaluation—the worry that others will negatively perceive us and our swimming—correlates with competency. The more you worry what other people think, the less competent you are to view yourself. And more critically, when athletes were tested for levels of FNE, those who tested higher were more likely to choke under pressure. We are natural-born comparison makers. Some swimmers use comparison-making to get themselves fired up and rise to the occasion while others use it as a way to feel down on themselves. If comparing your swimming to that of other swimmers isn’t motivating you and bringing out your best, it’s wasted energy. Basing our mindset, our effort and consequently our performance on how other swimmers do is demotivating, anxiety-inducing and leaves you feeling helpless. During practice what’s your attitude toward failure? Do you fear it to the point that you mail in your effort? More likely you view practice as a place where you can fail and do so largely without repercussion. If you have a bad practice or you fail the main set it’s not the end of the world because there will be another practice tomorrow. Competition, on the other hand, can feel like an “all or nothing” type of thing. We hold up that one race, those precious few minutes and seconds, and use it as a measuring stick for all our swimming and even ourselves. Framing anxiety as a bad thing. Anxiety in itself isn’t a bad thing. The pre-race butterflies that everyone gets before a race is natural and is actually designed to help you physically prepare for an epic performance. Muscle flow to target areas increases. Non-essential systems power down. Adrenaline starts to course through your veins. This is your body literally giving you the space shuttle countdown for some hilariously fast swimming. But for swimmers who crash and burn with anxiety, it’s because they view it as something that is wrong with them and go out of their way to try and mitigate it (which usually only ends up making things worse). Anxiety isn’t the enemy—it’s how you frame it that decides what kind of effect it has upon you. Great, you might be thinking. I can identify with some of these things. What can I do about them? How do I begin to battle these things back so that I can let loose, enjoy myself and just swim fast? What’s your ideal pre-race mental and emotional state? Look back at the races where you’ve performed like a boss and write down how you felt and what you were thinking. These are the things that work. Knowing them gives you a blueprint for what kind of emotional and mental state you are striving to be when you step up on race day. Step up the stakes in practice. Swimmers who don’t compete to the limit and don’t try to push boundaries in practice, or who don’t race teammates, or who aren’t willing to throw down under adverse situations in practice are liable to choking under pressure, because they haven’t experienced it. You can inoculate yourself from getting psyched out or too nervous by purposely putting yourself into challenging situations where you don’t know if you will be successful. Make practice harder than competition—not just in terms of yardage but in pressure and stress. Get up swims. Test sets. Race your teammates. Bring the competition experience to practice. Pre-race routine your race day like crazy. Put a list of things together that you can control. Race day routines give you a strong sense of familiarity, give you a sense of rising momentum (accumulated little wins as you progress through your list), and keeps you focused on your own preparation. Stick to your process. Lean on your performance cues. Don’t expect things to go perfectly. Worst case scenarios are worthwhile in that they help you be mentally ready for when things go wrong (and they almost inevitably will!). The warm-up pool will be a gong-show. You don’t have enough time to fully prepare before the race. Your cap rips three heats before the race. This isn’t fixating on worst-case outcomes—it’s imagining them, and then imaging yourself overcoming them that will help you stay calm when the chlorine hits the fan. Visualize adversity…and then you overcoming it. It’s not anxiety, it’s excitement. The butterflies, the nerves, the border-line shaking that happens on race day—it’s all natural and it’s all part of the experience. We all experience it, from noobies to Olympic champions. Pre-race anxiety is part of the racing process. The only difference in whether it helps you or crushes you is in how you frame it. Reframing anxiety as excitement by simply saying “I am excited!” has been showing to significantly increase performance. Rethink your relationship with the pre-race nerves—they are there to help you if would just let them do their thing.